The Oakland Raiders are one of the few NFL franchises that tend to make the wrong decision every single year in the NFL draft. The most recent draft bust in Oakland was troubled quarterback JaMarcus Russell. Regardless of how many chances this struggling NFL franchise gave to Russell, the Raiders never saw the franchise caliber quarterback that they thought they drafted out of LSU. As a result, the Raiders cut their losses before last season by making a trade with the Redskins for Jason Campbell and releasing JaMarcus Russell. Even though Jason Campbell is no Tom Brady or Peyton Manning, his improved play under center was enough to lead the Oakland Raiders to their best record (8-8) in almost a decade. Despite just missing the playoffs and a chance to win the AFC West division title, the Oakland Raiders were headed in the right direction with a vastly improved offense both in the air and on the ground. The Oakland Raiders may be a predominantly running football team with running backs Darren McFadden and Michael Bush leading the way out of the backfield, but their offense is just one or two players away from being just as dominant in the passing game. It is still uncertain whether or not Jason Campbell is the right man under center for the Oakland Raiders, but Al Davis and company did something to give them a bit of an insurance policy this season by drafting Ohio State quarterback Terrell Pryor in the NFL supplemental draft. Although there are quite a few NFL analysts and critics that believe Terrell Pryor will never be able to play the quarterback position on the NFL level, the Oakland Raiders were willing to take a chance on another hybrid quarterback with a tremendous amount of talent. Due to his problems with Ohio State before he made himself eligible for the NFL supplemental draft, the league has suspended the rookie quarterback for the first five games of the season. 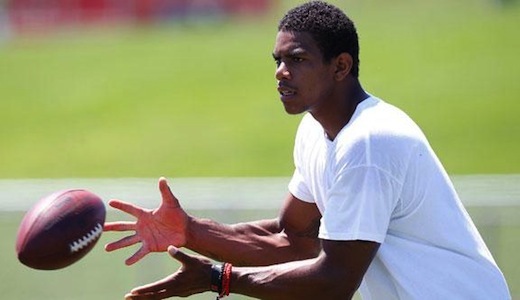 This means that Pryor cannot participate in practice or games until after Week 5 of the upcoming NFL regular season. Despite the suspension and negative press surrounding Terrell Pryor, the Oakland Raiders have rolled the dice once again and as of today have signed the rookie to a four-year contract. After drafting Pryor, the Raiders said that they would use him primarily as a wide receiver or maybe even a tight end, but now new head coach Hue Jackson has changed his stance by saying that after Week 5 he intends to use his rookie as a quarterback. This will almost certainly put a lot of pressure on current starting quarterback Jason Campbell in the first five weeks of the season. If Campbell struggles during this time period and the Raiders’ record reflects that struggle, Jackson will probably make the change at quarterback or at least give Pryor a shot to show what he can do under center. Terrell Pryor will make his first appearance as a member of the Oakland Raiders this Monday night against the New Orleans Saints and should play in the following preseason game against the Seattle Seahawks.